Is a practical reference guide designed to focus on the specific and varied requirements of researchers and advisors. The book focuses on a standardized style and format for writing a thesis, features the guidelines suggested by the MLA and the APA, and explains and illustrates the Number system and the traditional footnote style. 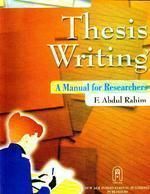 The book includes a comprehensive treatment of thesis organization and documentation and extensive specimen pages of the various elements of the thesis. Problem areas such as thesis statements, quotation handling and paraphrasing without plagiarism, and documentation of multivolume works are effectively exemplified. Also included are a detailed chapter on punctuation and mechanics, a chapter on some reminders on the question of style, and a thesis evaluation form. Guidelines for writing a research paper, along with some writing samples, are also incorporated. A thesis typing guide sheet accompanies the book. Thus this Manual is a friend in need for the researcher. About the Author Dr. F. Abdul Rahim, Professor of English, Annamalai University, received his doctorate degree in English from Oklahoma State University, USA. His dissertation was on Emily Dickinson. He was the Assistant Director of Freshman Composition in the Department of English, OSU. He has published articles and reviews on English and American literature and ELT, under very respectable literary auspices. As one aware of the methodological inadequacies of the Indian researcher, vis-a-vis, the exacting and near perfect standards that Universities abroad generally expect and insist on, Dr. Rahim endeavours to serve the especial needs of the researcher in this country, by focussing on his writing needs and problems. Table of Contents Thesis Layout: Preliminaries Text of the Thesis Notes and Reference Materials Tips of Typing: General Considerations Specifics How to use Quotations and Paraphrase: Preliminaries Parenthetical Documentation Content Notes Work Cited Other Methods of Documentations: Author -date Method (APA Style) Psychology Sociology / Political Science / Geography Biology and Earth Sciences, Business, Commerce and Economics: Education, Linguistics Number System Chemistry Computer Sciences Mathematics, Physics Medical Sciences Footnote System Rules of Format, Punctuation and Mechanics Style.